Growing up in Southern California, we learn something called the stingray shuffle. It means, every time we walk out into the surf, we kick up sand to scare all the stingrays away. This is to prevent stinging. Although I was never personally stung, I witnessed quite a few lifeguard rescues and stingray first aid, and this of course incited a fear in me. Lots of people have this fear of stingrays, I know, and after Steve Irwin’s untimely death, I’m sure these guys will continue to suffer undue persecution. 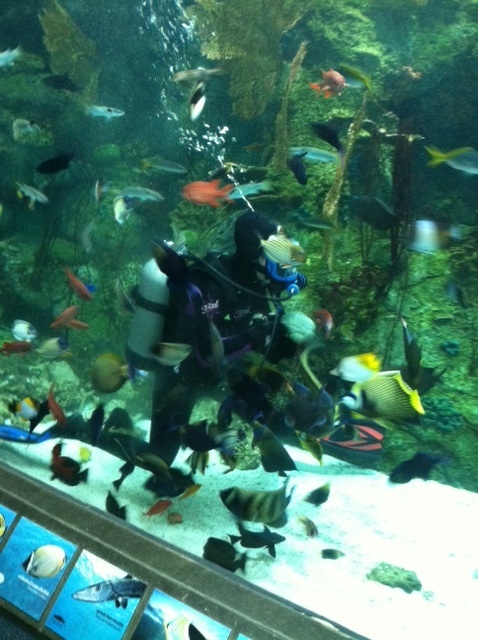 Once a person becomes a scuba diver, things that seemed scary suddenly seem cool. Such was my experience with stingrays, who went from mysterious underwater feet assassins to shy silky treasures. I still had reservations about them, but to see one suddenly felt like a gift. At the Aquarium of the Pacific is where I learned stingray etiquette, and truly fell in love. 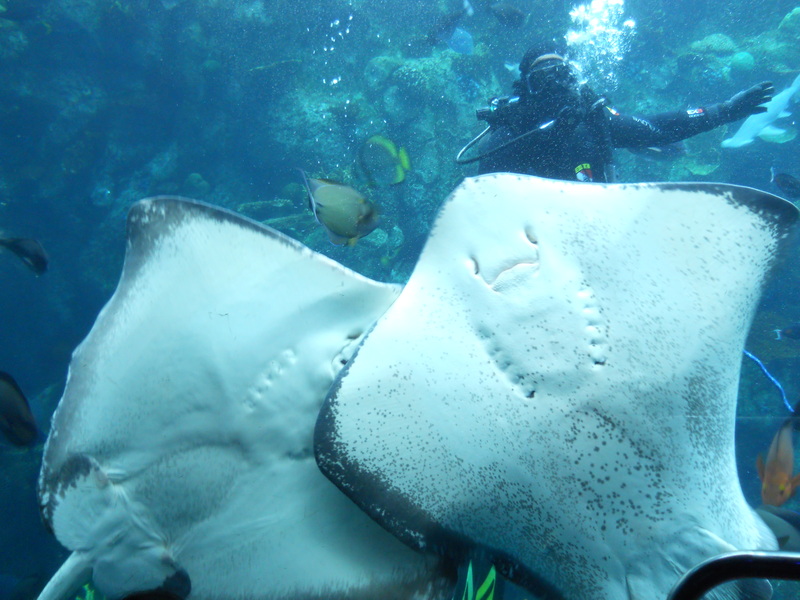 In the largest exhibit, Tropical Reef, there are approximately 5 Southern Stingrays. We used to feed 3 by hand, but now we’re down to 2. And yes, you read that correctly, we feed these Southern Stingrays by hand. Divers don’t get much hands on action with rays while open ocean diving (except of course, Utila’s very own Gunther who swears he has some wild pets he caresses…more later), but in the Aquarium, we target feed (blog to follow) certain animals in specific areas to ensure equal opportunity feeding. The Southern Rays in this exhibit have been conditioned to feed at the acrylic glass so guests can have a few of their mouths sucking in food. These guys are bottom feeders, whenever I see them in the ocean eating, they are surrounding by a cloud of sand, so to watch them eat is a unique opportunity. Southern Rays have no teeth, but they do have a sting. It is located at the base of their leptoceral tail. At the Aquarium, I tell people it is like a fingernail, and we trim it. So the rays in this exhibit pose no stinging threat, and no teeth threat. They’ve always been conditioned to associate divers with food, which means that, they’re not shy (with us, or with each other). A Stingray feels like a wet pillow when he swims into you, soft, slippery, and a little heavy. These fellas are gettin frisky! Feeding these Stingrays by hand takes precision and timing. First, I position myself on the right side (left side for the dry side) of the acrylic. The Stingrays recognize the food bucket and are there immediately. They quickly become impatient, and begin to bite each other. The Crimson Snapper in the exhibit sees a window of opportunity and makes his way over as well. I pull out a piece of mollusk, and keep it palmed. The rays sense the food with their receptors, and start to bite at each other, forcing me to gently separate them. Both of the rays I’m feeding are covered in white scars. Then, I slide my hand between the ray and the acrylic, keeping the food in my palm with my thumb. As I get closer to the mouth, I attempt to strategically move my thumb and slip the food in. This is important. A few things can go wrong here: 1) I accidentally slide the food out with my thumb and the Red Snapper eat it, 2) I don’t move my fingers fast enough and into the mouth they go as well (this feels similar to slamming my fingers in a door), 3) I lose my neutral buoyancy and start to sink/float trailing the rays with me. These babies get aggressive around the food, and sometimes it is necessary to back off from the glass and let them calm down before feeding them again. But what the guests get to see is, the underside of a Southern Stingray sucking food into his mouth without the usual cloud of sand, and without the possibility of a sting. Some people even go far enough to call them “cute” (me included). And this is how I learned to love the Southern Stingray. Pretty cool right?